What wonders await bot within The Cage? Will he find answers to the questions deep in his mind? Or do only horrors await? just found out that my anti-spam filtering plugin has been marking everybody’s comments as spam the past couple days, so if you don’t see a comment you left over the weekend, that’s why. been trying to go through and un-mark legitimate comments, but there’s a lotta spam to sift through, so apologies if i miss yours. situation’s been fixed now, though, so comment away! we’ll see, f_f! although bot has been pretty unlucky so far… hmm. Oh no poor Jefbot. But maybe he’ll find Cel and all will be well. Really loving the art. I’m guessing he’s not actually walking into a cage cause otherwise Rabbit Inventor would stop him? Although, he did give him the tea and omit that it had hallucinogenics so…maybe I am giving him too much credit? i think your first theory’s sound, theBean – if bot’s actually been shrunken down and is now small enough to enter that cage then the Cave Rabbit has tech that’s more impressive than previously thought! but then, you never know. things have been pretty crazy for bot as of late. Hope the Rabbit has some cake. agreed – the book and the Disney movie are great, DJ! I am seriously amazed by the artwork involved in today’s update. I absolutely love the eerie/mystical look these three panels have. 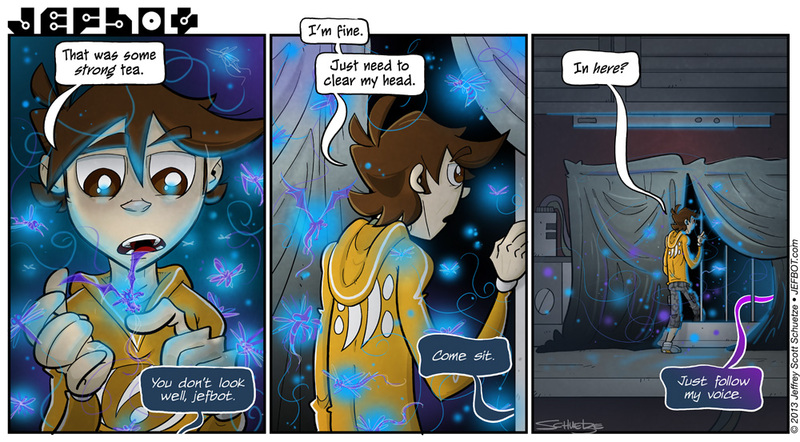 I especially love the blue glow in Jefbot’s eyes in the first panel. Meanwhile, I can barely draw stick figures. I have a theory about the blue speech bubbles. It appears that the regular blue ones belong to the Cave Bunny, but the purplish ones are Jefbot’s imagination playing tricks on him. In fact, it seems that his imagination is a big fan of the colors blue and purple, judging by the colors of the things floating around in the air. Hmm . . . I’m starting to question whether the Cave Bunny is real or not. I guess the tea should have had a label that said “drink me” on it. Hopefully Jefbot can find some cake with a label that says “eat me”. heheh. let’s just hope bot’s heading into Wonderland, GB, and not someplace more sinister. I like how there are dragonflies and dragons. I have a strange feeling that Sir Cottonbottom’s messed up eye is talking to ‘bot. let’s hope bot doesn’t look into that creepy eye then, ROM! always bet on bot, r61!!! or is that, “always bet on bunny”? Despite all my rage, I’m still just a Bot in a cage. then bunny’s will say bot is lost and can never be saved. Duuuuuuude . . . let’s hope that’s not Cave Bunny’s evil side. *finger’s crossed* Sarah W! bot betta be on his guard. Jeffbot never was one for caution. LOL How deep does this rabbit hole go? Let the quest for sanity and scarfs begin. Oh dear, Bot is tripping some serious balls now. Let’s just hope he can snap out of it soon. Now I would like to think that Mr. Cave Bunny is a straight kind of fellow, not a shady manipulative one. So I am going on a limb here and say that Jefbot is hearing hallucinogen- induced voices and where he is going is affected by his subconsciousness OR there is a telepathic being around and Tea made Jefbot receptive just enough to make a connection. either theory is valid so far, Maryz! either way, the sooner bot figures out what’s going on, the better. Those are some awesome hallucinations he’s having. I don’t think I’d mind having purple dragon, dragonfly, butterfly, etc. hallucinations. Too bad there isn’t any guarantee in advance of what kind you will have. That (among other things) is enough to make me avoid hallucinogens. Can’t wait to see what else awaits Bot in the Cave! Alice goes into the rabbit hole. indeed, PJ Day. let’s just hope he can get out. Wow. I absolutely love the lighting in panel 1.